As the new leaves of Spring unfurl and the winds over the lake soften, Silver Waters Sailing gets underway once again for Year Sixteen. 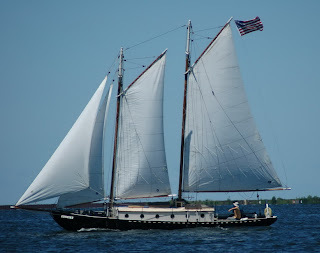 We are celebrating 15 years of navigation on lake and bay with a sample sailing freebie on June 20 and 23, and also with the release of a new book, “Maritime Tales of Lake Ontario,” being published by The History Press of South Carolina. It is due out later this summer--128 pages, lots of great reading and photos and some wonderful artwork by Peter Rindlisbacher, an extremely capable Canadian artist. His paintings of 19th Century naval vessels and sailing scenes have appeared in a number of history books. Captain Sue is very pleased and excited to include his work in the book. We will again be sailing out of the Pleasant Beach Hotel dock. We also are hopeful that the good ship Sara B will set sail again this season. She has been laid up for two years getting a re-build of sorts (see www.sarab.brownroad.com for all the details). If all goes well, Fair Haven's 'small ship' may spread her white wings on the bay possibly next month. Silver Waters offers individual or group sailing instruction, flexible scheduling from two hours to two days, and woman-only classes on bay and lake. Our mission continues to be to raise awareness of and appreciation for our Great Lake. Fresh water ecosystems like this one are increasingly under pressure. New energy production technologies, changing land use and national policies, and shifting weather patterns pose challenges to the Great Lakes ecosystem and its human users. History marches on. It's the best of times and the worst of times. Catch the wind and sail free. You still can! 0 Comments to "Silver Waters Sailing Celebrates 15 Years"